The famous chawls of Mumbai are slowly vanishing from the city’s landscape. So Arjun Mukherjee’s portmanteau film, 3 Storeys, evokes a touch of nostalgia for a way of life that involved whole communities living in close proximity, and becoming like family to one another. The three stories, narrated by a female voice revealed at the end, are woven around the chawl called Maya Nagar. They are unconnected, even though various characters living there saunter through all of them. 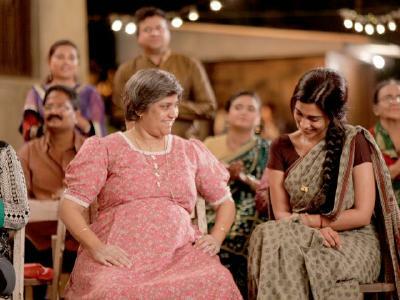 The first—most interesting and most unconvincing too—involves a well-dressed Vishal Naik (Pulkit Samrat) willing to pay four times the price for a room in the chawl to the crabby Flory Mendonca (Renuka Shahane—artificially aged and padded). As they make small talk over coffee after the deal is signed, the mystery of the overpriced room is revealed, and there is a just desserts kind of twist in the tale. The other two stories are prosaic by comparison. One has unhappy, battered wife Varsha (Masumeh Makhija) and her broken heart; Shankar, the man she loved (Sharman Joshi), asked her to wait for a year and never showed up. In the age of mobile phones, this contrived yarn about a tragic misunderstanding does not quite work. In the third, a Muslim boy Sohail (Ankit Rathi) elopes with a Hindu girl, Malini (Aisha Ahmed), only to discover the shocking reason why their parents oppose their romance. In the background, is brightly-clad, siren (Richa Chadda) and her silent admirer, a burly cop, Ganpat (Himanshu Malik). The cast is efficient, the film has a bearable running time, but it is not consistently engaging. It’s set in a chawl just so that the narrator can look into the lives of the characters, since the somewhat open style of architecture encourages snooping; but the quaint Mumbai institution ought to have played a greater part in the narrative. Think Jaagte Raho, Piya Ka Ghar and Katha among others.